SEOUL, Nov. 16, 2010 – LG Electronics (LG) today announced that worldwide sales of its Optimus One smartphone have hit one million units just 40 days after the phone’s initial launch. Now available in most of Europe, Asia-Pacific countries and the USA, the Optimus One is the fastest selling mobile handset in the company’s history. One of the first smartphones to launch with Google’s latest operating system, the Optimus One allows for up to three times faster internet browsing, web-page loading, and multi-tasking. The Optimus One also incorporates a unique LG-designed user-interface (UI) along with a camera that features face tracking and smile shot, a 3.2” wide HVGA screen and a long-lasting 1500mAh capacity battery. With a nod to style-conscious users, LG’s new smartphone comes in a wide range of color schemes including black, wine, titan, blue, silver and purple. Exact color availability will vary from market to market. With the global roll-out still under way, the Optimus One will soon be available via 120 carriers and partners. 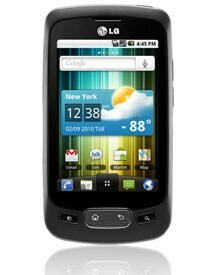 LG expects Optimus One to be its first 10 million-seller smartphone.